The "Belgica" left Antwerp at the end of August, 1897. She steamed and sailed down the Atlantic to Madeira, then across to Rio de Janeiro, down to Monte­video, and into the Strait of Ma­gellan to Punta Arenas. After spending some time in the Fue­gian Channels and among the Cape Horn Indian tribes, we took our departure from the known world at Staten Island on January 13, 1898. We sighted the South Shetland Islands a week later, where, in a vio­lent tempest, we lost by an acci­dental fall over­board the young and faithful Nor­wegian sailor Wencke. 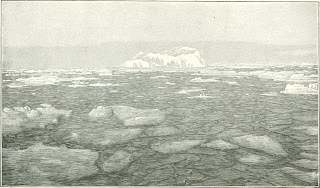 We next crossed the ever-foggy and ever-tempestuous waters of Brans-field Strait, and on the afternoon of the 23d of January, 1898, came in sight of the outer fringe of a new land, the Palmer Archipelago. Entering this, we discovered a new highway, which in size compares favorably with Magellan Strait. To the east of this strait, we charted about 500 miles of a land which had never before been seen by human eyes - part of a great continental mass which probably surrounds the South Pole. It is buried even in midsummer under a ponderous weight of perennial ice. Pass­ing out of the strait, we entered the South Pacific, and after skirting the western border of Graham Land to Adelaide Island and then to Alexander Island, we attempted to enter the main body of the pack-ice westward. On the longitude covered by the drift of the "Belgica" no explorer before us had ever entered the main body of the pack-ice. The previous work of exploration there had been confined to the outer fringe of the drift along the edge of the pack. The pioneer of this work, as of much that is polar, was Captain James Cook. In 1774, he searched the pack edge for an open road poleward, and on the one hundred and sev­enth meridian he penetrated south­ward to somewhat below the seven­ty-first parallel. In 1821, Captain Bellingshausen, a Russian explorer, following in the wake of Cook, skirted the ice limits, and dis­covered an iso­lated island which he named Peter Island. Further eastward, Bellingshausen also discovered what seemed to him to be part of a large country. This was named Alex­ander Land. Eleven years later, Captain Biscoe, a British sealer, passing from the west eastward, some­what north of the ice limits, dis­covered, as he thought, a series of islands, fronting a high country. The country he named Graham Land; the largest island, Adelaide Island; and the group, Biscoe Is­lands. The existence of these islands is, how­ever, doubtful, as the "Belgica" sailed over the region where they are charted, and did not encounter them. 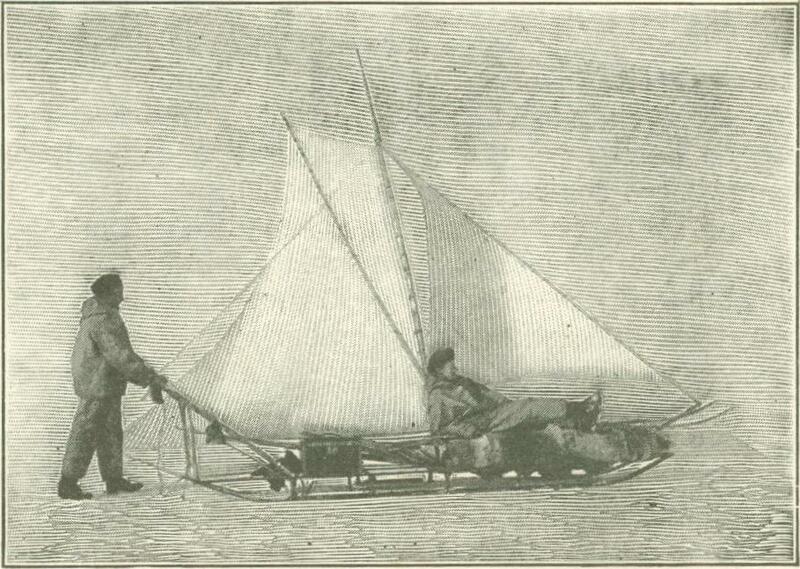 In 1839, Lieu­tenant Walker, commanding the schooner "Flying Fish," a New York pilot boat form­ing a part of the United States South Sea Exploring Expedition, under Admiral Wilkes, pushed along the ice and into a bay to the seventieth parallel of south latitude. Walker saw here a "barrier" and "appearance of land." But the "land" does not exist, for we drifted over the spot, and found there a sea about 1,000 feet deep. Our acquaintance with the south polar pack-ice dates from February 13, 1898, and ends with our escape on March 14, 1899. We first encountered it off the eastern border of Graham Land, before crossing the polar cir­cle. Here it was broken into small pieces, mixed with many glacial fragments and studded by innumerable icebergs. While trying to keep the coast in view, we steamed among a number of streams of small frag­ments of drift-ice. An on-shore swell forced the ice together, and we were hopelessly held for the night of the 13th. To the east of us were the high peaks and limitless gla­ciers of Graham Land. The country was visible for only short periods and in patches, for a high fog hung constantly over the land, leaving only an opening here and there. To the west, the sky was fairly clear. 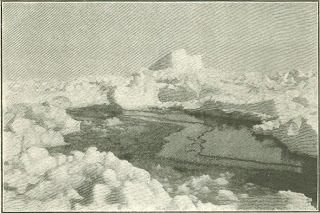 A dark smoky zone near the horizon indicated the limits of the ice and an open sea beyond. Hundreds of icebergs were on the horizon. These were of a size and type quite similar to those of the Arctic Sea. The entire mass - icebergs, sea-ice, and the ship - rose and fell with the gigantic heave of the South Pacific, and for a time it seemed as though we should be carried with the moving drift against one of a number of small islands. But a change in the direction of the wind on the following morning so separated the ice that we were able to force our way out into the open sea westward. After the first experience of the, ensnaring powers of the drift ice we did not easily put ourselves in a position to be again entangled. The season for a campaign to the far south was past, but M. de Gerlache thought it in­cumbent upon himself to make as strong an effort as possible to push into the main body of the pack and beat the "farthest south" of other explorers. The entire scientific staff were opposed to this effort, because it was thought to be too late in the season. No direct opposition, however, was offered when the "Belgica" was headed southward. She was forced into the pack and out again, time after time, making after each rebuff a new effort farther westward. 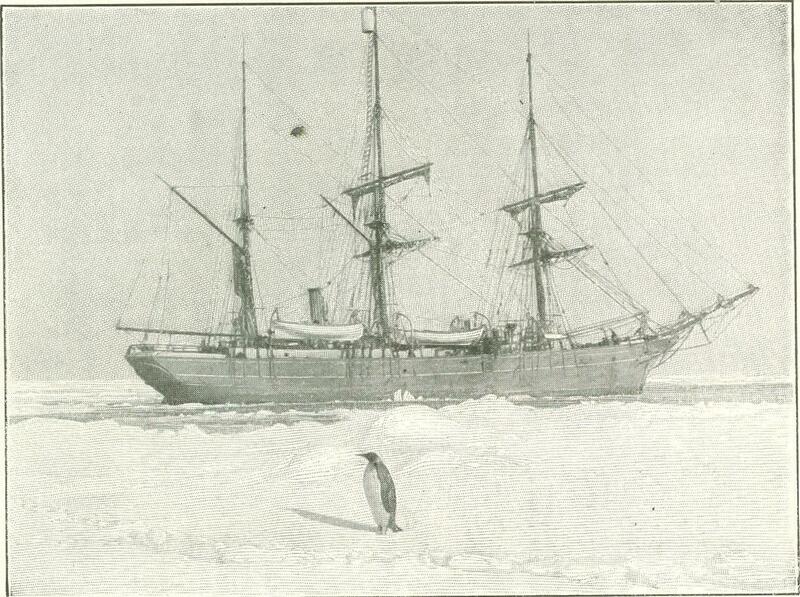 On February 28th we were forced to take to the ice that the ship might better ride out a howling storm. I can imagine nothing more desperate than a storm on the edge of the pack. At best it is a cold, dull, and gloomy region, with a high humidity and constant drizzly fogs. Clear weather is here a rare exception. Storm with rain, sleet, and snow is the nor­mal weather condition throughout the entire year. During the day of the 28th we were unable to get a glimpse of the sun, and were in consequence in doubt as to our actual position. There was some­thing about the sea and sky which promised a night of unusual ter­rors. The wind came in a steady torrent from the east, and with it came alternate squalls of rain, and sleet, and snow. Hour after hour it blew harder, and before night it brought with it a heavy sea studded with moving mountains of blackness. 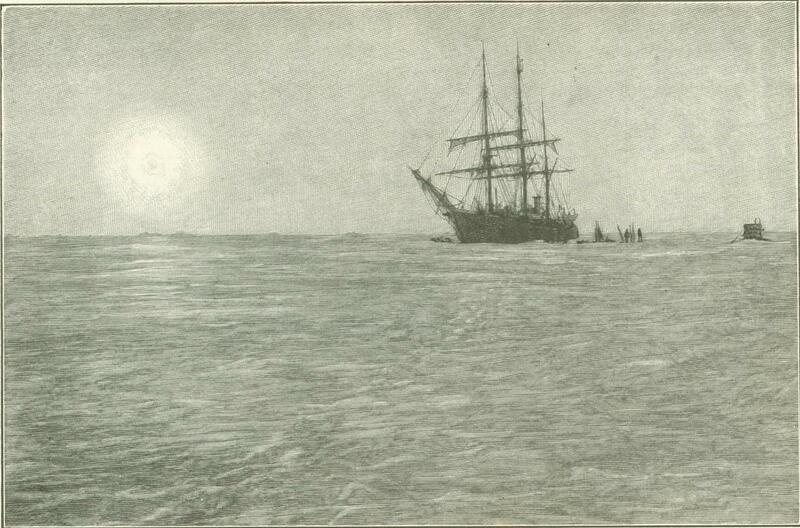 The "Belgica" ran westerly before it almost under bare poles, and edged closer and closer toward the fragments of ice to the south, where the sea was easier. The sky to the north and east was smoky and wavy, as if a number of huge fires were there sending out gusts of smoke. On the southern sky there was a bright, pearly zone. This was an ice blink, a reflection of the ice beyond our hori­zon upon the particles of watery vapor sus­pended in the air. As night came upon us it became necessary to choose between the forbidding blackness of the north and the more cheerful, but less hospitable, whiteness of the south. With icebergs on every side, always in our course, coming as suddenly out of the thickening darkness as if dropped from the skies, it was not wise or prudent either to move out of, or to rest in, our position. To be more friendly with the ice, or to rid ourselves entirely of its companionship, was plainly our duty. We decided to seek the harboring influence of the pack, as an experi­ment, to ride out the increasing fury of the tempest. 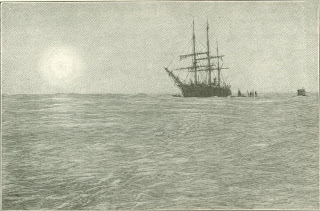 The "Belgica" was headed southward, and quickly plowed through the trembling icy seas. But the noise and commotion which came to a climax every time she rose to the crest of a great swell were terrible. The wind beat through the rigging like the blasts out of a blow-pipe, the quivering masts swept the sky with the regularity of the pendulum the entire ship was cov­ered with a sheet of ice. As the eye dropped over the side of the ship the sea glittered with the bright­ness of a winter sky. This bright­ness of the sea, with the sooty blackness of the heavens over it, formed a weird contrast, never to be forgotten. Here and there were sparkling, semi-luminous pieces of ice which sprang from the darkness with meteoric swiftness, and were again as quickly lost in the gathering blackness behind us. These frag­ments increased in number and in size as we pressed poleward; but the "Belgica" would strike and push them aside as a broom removes dust. After a short but very exciting time, the pieces of ice became more numerous and of larger dimensions, and the bergs were so closely grouped that further progress seemed impossible. The sea rolled more and more, in long, easy swells, as we passed through the ice. This eased the ship, and made mat­ters more comforting to the sufferers from sea-sickness. I must hasten to confess that about one-half of us were thus afflicted at this time. Still, we tried to be cheerful. I cannot imagine any scene more despairing, though, than the "Belgica" as she pushed into the pack during this black night. The noise was maddening. Every swell that drove against the ship brought with it tons of ice, which was thrown against her ribs with a thundering crash. The wind howled as it rushed past us, and came with a force that made us grasp the rails to keep from being thrown into the churning seas. The good old ship kept up a con­stant scream of complaints as she struck piece after piece of the masses of ice. Occasion­ally we would try to talk, but the deafening noises of the storm, the squeaking strains of the ship, and the thumping of the ice made every effort at speech inaudible. 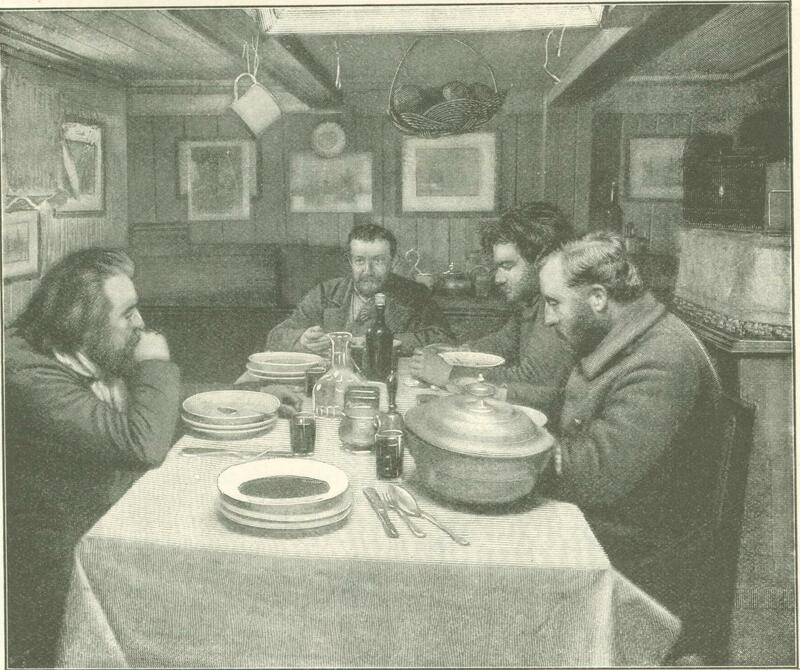 With our stomachs dis­satisfied, and our minds raised to a fever-heat of excitement, and with a prospect of striking an iceberg at any moment and going to the bottom of the sea, we were, to say the least, uncom­fortable. When we had entered sufficiently into the body of the pack, and were snugly surrounded by closely packed ice-floes, the sea subsided, and here the overworked ship rested for the night. In the morning the wind changed to the northeast, and the ice separated, leav­ing long open leads of water. These leads offered a tempting highway pole-ward, and De Gerlache was not long in deciding the course. With a fair wind pressing the sails and with steam, we pushed to the south. 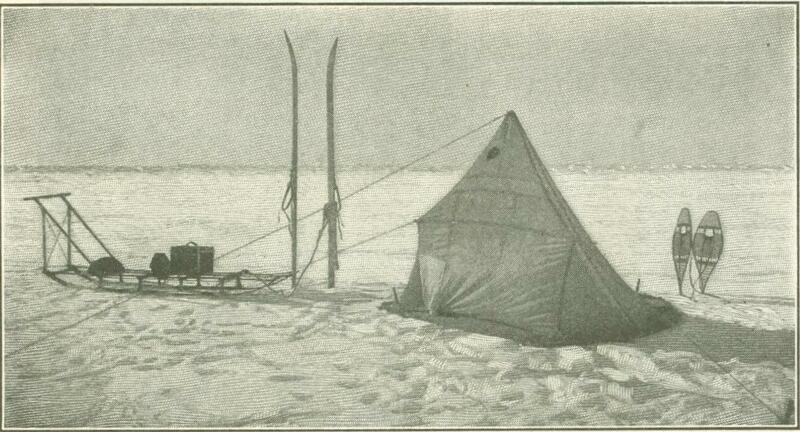 The navigation was not easy; still it was less difficult at this time than it usually is in an Antarctic pack. The pans were small - from fifty to 100 yards in diameter and about four feet thick. They were sep­arated by quantities of pul­verized fragments and new ice. Evenly scattered about in the icy expanse were numerous icebergs: usually about 200 could be counted from the crow's-nest. The navigating officer remained at the masthead, and directed the course of the ship. It was exciting navigation. 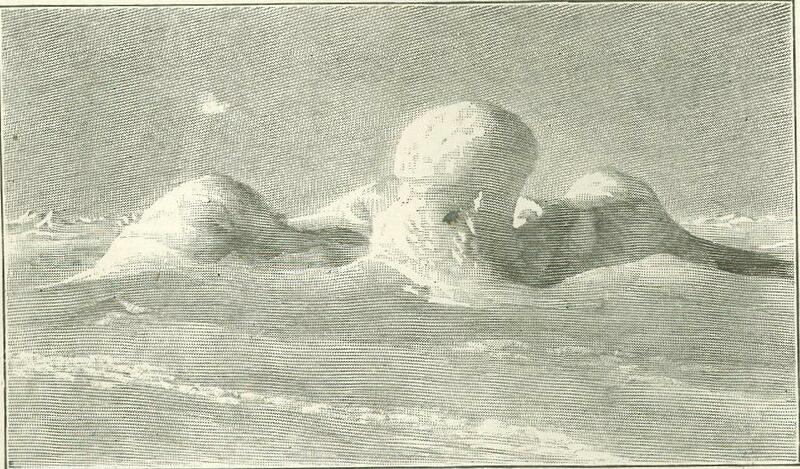 The sky in the north was lined with heavy, lead-colored clouds; in the south there was the ever-bright ice blink. Petrels in large number and in great variety hovered about us, as if to ask our business in their domains. Penguins walked about on the ice, uttering squeaky noises that re-echoed from berg to berg. Seals, lazily sun­ning themselves, came to the edge of the floe to see the human intruders. Meanwhile the ship was forced on in a wild way into the ice. Now she was run upon the floes to break them; again she was pushed be­tween to force them aside; but always she was fighting an uneven battle against the huge masses of ice. 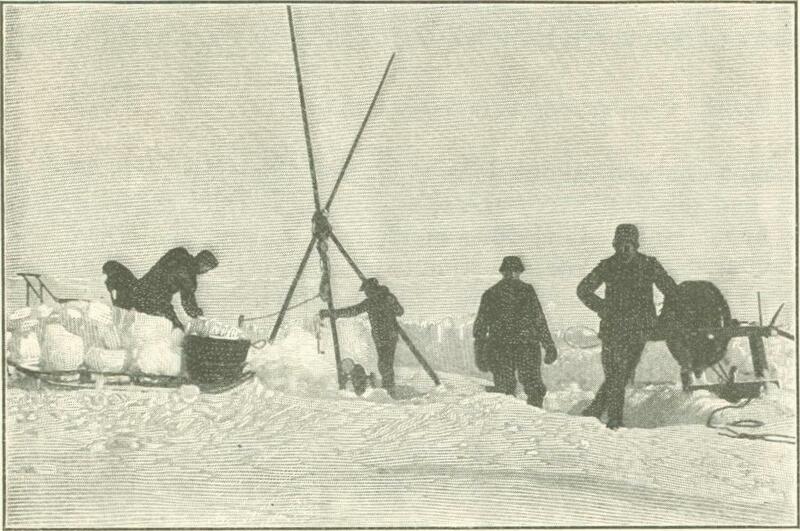 After two days of this ice-ram­ming, we found that we had passed through about ninety miles of ice. We were now made to real­ize that further progress was im­possible. The ice was too closely packed; and the floes were here heavier: it was no longer possible to break them or to push them aside. We were so closely hugged, indeed, that movement in any direction was impossible. To the south there were several lakes visible from the crow's-nest, and to the northwest there were also spaces of open water; but after various efforts we found ourselves unable to reach these. On the 4th of March, we were forced to admit our inability to extricate ourselves. Our position at this time was latitude 71° 22', longitude 84° 55' - about 300 miles across the polar circle and about 1,100 miles from the geograph­ical pole. The nearest land was the still un­known Alexander Island, about 300 miles eastward. We were now firmly fixed in a moving sea of ice, with no land and noth­ing stable on the horizon to warn us of our movements. Even the bergs, huge, moun­tainous masses, though appar­ently fixed and immovable, sailed as we did, and with the same apparent ease. The as­tronomical positions which we obtained from the sun and from the stars indicated to us that we drifted from five to forty miles per day. It is a strange sensation to know that, blown with the winds, you are moving rapidly over an unknown sea, and yet see nothing to indicate a movement. We passed no fixed point, and could see no pieces of ice stir; everything was quiet. The entire horizon drifted with us. We were part of an endless frozen sea. The ship and her cargo of men were compelled to rest thus, on a huge cake of ice, for nearly thirteen months. In this time we drifted about 2,000 miles. We drifted in a zigzag course, but generally west never knowing our destination, and always conscious that we were the only human beings then to be found in the entire circumpolar region at the bottom of the globe. Resigned to our fate, we tried to make the best of our hard lot. To be caught in the ice is, after all, the luck which polar explorers must expect. Our first duty was to Pre­pare for our stay through the coming night. The summer days of midnight suns were past. The premonitory darkness of the long night was falling upon us with marvelous rapidity, for on this latitude the sun dips below the southern skies at midnight late in January. This dip increases and sweeps more and more of the horizon every day until early in May, Cohen the sun sets and remains below the horizon for seventy-one days. When we first skirted the pack-ice in February there were a few hours of bright twilight at midnight. The darkness then was not sufficient to pre­vent navigation throughout the night ; but now it was really dark for eight hours. The temperature, too, was falling rapidly. We had been led to believe by the experi­ences of previous Antarctic explorers that the tempera­ture, compared with the Arc­tic, would be more moderate; but in this we were disap­pointed. An icy wind came from the south, brushing the warm, moist air seaward and replacing it by a sharp, frigid atmosphere. The tem­perature fell to ten degrees below zero, then to twenty, and later it descended to thirty, forty, and finally forty-five below. The months of March and April were, in many respects, the happiest months of the year. Everything at this time was new to us. We found interest in the weird cries of the penguins, we found pleasure and recre­ation in hunting seals, and we prided our­selves on our ability to wing petrels for speci­mens. Everything about the new life and the strange white world around us was fas­cinating. The weather at this time was occasionally clear and always very cold, which was not the case dur­ing the greater part of the year. The pieces of ice gathered into groups, and united to form larger fields. The entire pack, one endless expanse of apparently motionless, but still constantly moving, ice, was full of interest to us. The sun presented a curious face in its rise and descent; and the color effects though not gorgeous, were attractive for simplicity of shades. The moon, too, had a distorted face as it came out of the frosty mist resting over the pack. The stars shone out of the heavy blue like huge gems. At this season the Aurora Australis displayed most its rare glory on the southwestern skies. We were drifting rapidly to the southwest - from one unknown sea to another still more unknown. "Per­haps we are on the way to the South Pole," was an every-day suggestion. Our first and most important work in the pack was to study the strange sea over which we drifted. This necessitated observations not only of the sea-ice and icebergs and the scant life about us, on the ice and in the water, but also of the composition of the water its depth the temperatures at vari­ous depths, and the material of the sea-bottom. It necessitated also a careful study of the atmosphere. The heads of the various scientific departments and their assistants were kept busy for a part of the time making these studies. 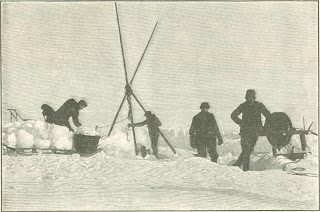 The sailors, in addition to assisting with the scientific work, were kept well engaged by the ordinary routine work of the ship and the work of embanking the vessel with snow to protect her from the expected cold of the coming winter-long night. By the 1st of May our ship was snugly finished for her winter im­prisonment. A roof had been placed over the deck amidships, and under it were an anvil and a fire for the use of the engineer in making the nec­essary iron­work. The cabins were rearranged to offer the greatest pos­sible amount of heat, light, and freedom from humidity. A floor was placed over the engine room, and on it a small stove to heat the officers' quarters. The galley was placed between decks next to the forecastle, into which could go the superfluous heat. Double doors and double windows were made every­where, and all possible openings where heat might escape were closed. Exteriorly, the sides of the ship were banked by snow blocks, the decks were blanketed by the constantly falling snow, and over it all the snow-charged winds drifted, making a neat and perfect embankment. Our Antarctic home, then, was under a huge snow-bank, on a field of ice which drifted with the winds over the unknown Antarctic seas. It was my delight to ascend to the mast­ head and from the crow's-nest view our horizon day after day. The general aspect of our view changed very little. Some new cracks formed in the ice, and old ones closed. 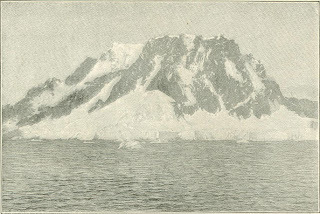 ­Some of the icebergs occasionally turned a little, showing a different face, but no marked alteration was ever visible in the general topography of the pack. Moving about as we were, there always seemed to be a possibility of finding a speck of land, a rock, or something new in our path; but this never happened. We saw no land during the en­tire drift. Appearances of land were re­ported every few days, but always proved deceptions. They were only illuminated clouds. Along the edge of the field in which we were frozen were large ridges or pressure lines, where the contact and pressure against neigh­boring fields raised fragments of ice above the surface. These ridges were from one five yards in height. The field, usually about two miles in diameter, was dotted everywhere by pyramidal and dome-shaped miniature mountains, which rose above the surface from two to twenty feet. These are technically called “hummocks.” Around the hummocks and along the edge of the floe penguins and seals rested sheltered from the wind. Near the ship and about the outhouses the snow was thrown up in great banks, dotted by black spots representing sledges, snow-shoes, sleighs, and general implements. As we emerged from the little hole on the port side which was our only exit, a narrow path led out about 100 yards to a circular hole through the ice. Over this we had erected a large tripod, from which we suspended the instruments for sounding and fishing and recording the deep sea temperatures. About midway between this and the ship, we erected a box shaped hut for nautical observations. About 100 yards from the stern of the ship, Mr. Danco erected a curiously shaped box for magnetic observations, and a little distance beyond, upon a convenient hummock, were placed the meteorological instruments. 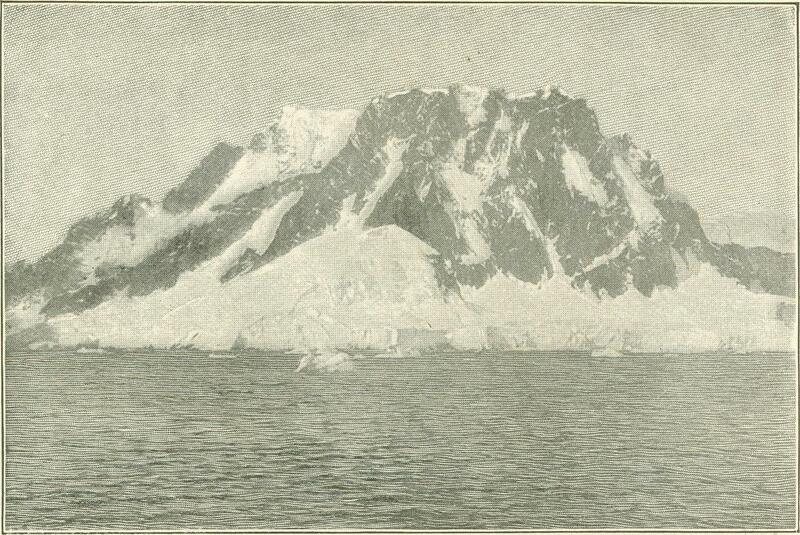 About 200 yards off the port bow a small house had been placed to capture the electricity from the Aurora Australis. Efforts were made to keep a path to each of these houses, but the work gen­erally proved futile. The quantity of drift snow was always so great that it buried every path and every irregularity in the ves­sel's vicinity. It was at no time possible to leave the ship without snow-shoes of some sort. The little exercise on the ice which freedom from duties permitted was taken on the Norwegian snow-shoe, the ski. For mere pleasure jour­neys these proved in every way superior to the Canadian rackets and other patterns; but where it became necessary to pull sledges or travel over rough paths, the other kinds were better. We made several long jour­neys to neighboring icebergs. Sometimes on these journeys we met with serious ob­structions and detentions. It was not found practicable to carry food, extra clothing, or camping equipment, and yet often the need of these became very great. The ice sepa­rating would leave large zones of water be­tween us and the next field, thus cutting off our retreat, and leaving us to spend hours of meditation upon the prospect of starva­tion and of death by freezing. The sun set on May 16th, to remain below the horizon for 1,700 long hours. The cold whiteness of our surroundings then assumed a colder blackness. For more than a month we had seen almost nothing of the real sun. Storm after storm kept the sky constantly veiled by a frozen smoky vapor. The bright and almost constant twilight which gladdened our hearts on first entering the pack quickly shortened to a gloomy grayness. This gray­ness then gave way to a soul-despairing dark­ness, broken only at noon by a feeble yellow haze on the northern sky. I can think of nothing more disheartening, more destruc­tive to human ambition, than this dense, un­broken blackness of the long polar night. In the Arctic it has some redeeming features. There the white invader has the Eskimo to as­sist and teach and to amuse him. The weather there is clear and cold ; and in the regions about Greenland, where I have been engaged, there is land - real solid land, not the mere mockery of it, like the shifting pack that was about us here. With land at hand pro­longed journeys are always possible, but what were we to do on a moving sea of ice? On the day following the actual disappear­ance of the sun, the wind changed to the south, the temperature fell to twelve degrees below zero, and, as was always the case in a southerly wind the weather offered promise of clearing. At noon an image of the sun appeared in the north. This was a distorted form of the sun, raised above the horizon by a refraction in the dense, ice-laden at­mosphere close to the sea line. But though it was only an imitation of the sun, it gave us a real joy, a pleasure indescribable. On the 18th, during the few hours of midday twi­light, we made an excur­sion to a neighboring berg to view the last signs of the parting day. It was a weird mission. I shall always remember the pe­culiar impression it pro­duced upon me. When we started almost all the party were outside, standing about in groups of three or four, discussing the prospect of the long winter night and the short glory of the scene about. A thing sadder by far than the fleeing sun was the sickness of our companion Lieutenant Danco, which was emphasized to us now by his ab­sence from all the groups, his sickness con­fining him to the ship. We knew at this time that he would never again see a sun­rise, and we felt that perhaps others might follow him. Who would be there to greet the returning sun? was often asked. If I remember correctly, my companions on the excursion were De Gerlache and Amundsen. Slowly and lazily we skated over the rough surface of the snow to the northward. 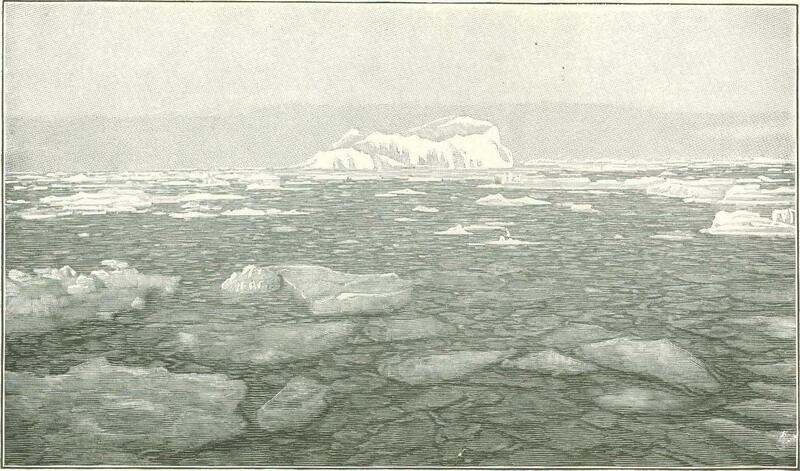 We had not gone far before we dis­covered that the ice was cracking and large leads were cutting off our retreat. We mounted hummocks of unusual height, and there awaited the imitation of the rising of the sun. Where the ice broke it separated, leaving a lane of black sea, from which oozed a steam like vapor - in reality a cloud of small icy crystals that fell on the neighboring ice-fields. The countless miniature mountains or hummocks, which covered the white fields had their northern faces brightened by a pale yellow light and their southern faces shadowed by a dull blue. This gave a little light to the usual lifeless gray of the ice-fields. Along the fresh leads there were a few penguins and an occasional seal, and in the water whales were spouting jets of breath. The pack, with the strange play of deflected light upon it, the subdued high lights, the softened shadows, the little speck of human and wild life and our good ship buried under its snows, should have been in­teresting to us; but we were interested only in the sky and in the northern portion of it. A few moments before noon the cream-col­ored zone in the north brightened to an orange hue, and precisely at noon a half of the form of the sun ascended above the ice. It was a distorted, dull semicircle of gold, heatless, rayless, and sad. It sank again in a few moments, leaving almost no color and nothing cheerful to remember through the seventy-one long days of darkness which fol­lowed. We returned to the ship, and dur­ing the afternoon laid out the plans for our midwinter occupation. We could do some fishing during the night, but no sounding. Very little, indeed, was done outside except the work of bringing in snow to melt for water and digging a path or a hole by which to get out. Each of us had planned a work of some magnitude to com­plete before sunrise. De Gerlache started to rewrite the ship's log. Lecointe began to complete the details of the summer's hydrographic work. Racovitza, in addition to regular laboratory work, was to plan the outlines of a new book on the geographical distribution of life. Arctowski had in mind a dozen scientific problems to elucidate. 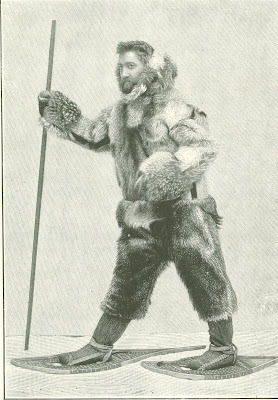 Amundsen entered into a co-partnership with me to make new and more perfect traveling equipment; and in addition to this, I had the anthropological work of the past summer to place into workable order and a book on Antarctic exploration. Thus we had placed before us the outline for industrious occupation; but we did little of it. As the dark­ness increased, our energy faded. We became indifferent, and found it difficult to concentrate our minds or fix our efforts to any one plan of action. The work planned was partly ac­complished, but it was done after the return of the sun. The regular routine of our work was tiresome in the extreme; not because it was difficult of execu­tion or required great physical ex­ertion, but because it was monoto­nous. Day after day, week after week, and month after month, we rose at the same hour, ate the same things, talked on the same subjects, made a show at doing the same work, and looked out upon the same unbroken icy wilderness. We tried hard to introduce new topics for thought and new con­coctions for the weary stomach. We strained the truth to introduce stories of home and of flowery future prospects, to infuse a new cheer; but it all failed mis­erably. We were under the spell of the black Antarctic night, and, like the world which it dark­ens, we were cold, cheerless, and inac­tive. Here is the outline of a day's life on the "Belgica." Rise at 7.30 A.M.; coffee at 8; 9 to 10, open-air exercise; 10 to 12, scientific work, such as the regular meteorologic magnetic, or labo­ratory tasks, for the officers; and for the marines, bringing in snow, melting snow for water, replenishing the ship's stores, re­pairing the ship, building new quarters, making new instruments, and doing any­thing which pertains to the regular work of the expedition; 12 to 2 P.M., dinner and rest or recreation; 2 to 4, official work; 4 to 4.30, coffee; 4.30 to 6, official work (regular work during this period was sus­pended for the greater part of the night); 6 to 7, supper; 7 to 10, card-playing, music, mending, and, on moonlight nights, excur­sions. At 10 o'clock we went to sleep. Up to this time our health had been fairly good. Excepting a few light attacks of rheumatism and neuralgia and some unim­portant traumatic injuries, there had been no complaint. We ate little, however, and were thoroughly disgusted with canned foods. We had tried the meat of the penguins, but to the majority its flavor was too "fishy." 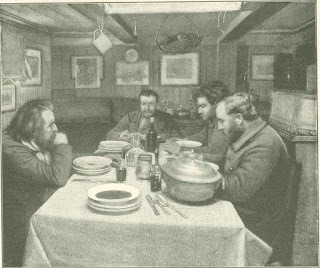 We entered the long night somewhat underfed, not because there was a scarcity of food, but because of our unconquerable dislike for such as we had. It is possible to support life for seven or eight months upon a diet of canned foods; but after this period there is something in the human sys­tem that makes it refuse to utilize the elements of nutrition contained in tins. Against such food even for a short period the stomach protests; confined to it for a long period, it sim­ply refuses to exercise its functions. Articles that in the canning retain a natural appearance usually remain, especially if cooked a little, friendly to the palate. This is particularly true of meat retaining hard fibers, such as ham, bacon, dried meats, and corned beef. It is also true of fruits preserved in juices; and vegetables, such as peas, corn, tomatoes; and of dried things. Unfortunately this class of foods formed a very small part of our store. We were weighted down with the supposed finer delicacies of the Belgian, French, and Norwegian markets. We had laboratory mixtures, in neat cans, and combined in such a manner as to make them look tempting - hashes under various catching names, sausage stuffs in deceptive forms, meat and fish balls said to contain cream, and mysterious soups; and we had all the latest inventions in condensed foods. But one and all they proved failures as a steady diet. The stomach demands things with a natural fiber, or some tough, gritty substance. At this time, as a relief, we would have taken kindly to something containing pebbles or sand. How we longed to use our teeth! The long darkness, the isolation, the tinned foods, the continued low temperature, with increasing storms and a high humidity, finally reduced our systems to what we will call po­lar anemia. We became pale, with a kind of greenish hue; our secretions were more or less suppressed. The stomach and all the organs were sluggish, and refused to work. Most dangerous of all were the cardiac and cerebral symptoms. The heart acted as if it had lost its regulating influence. Its action was feeble, but its beats were not increased until other dangerous symptoms appeared. Its action was irregular, feeble, and entirely unreliable throughout the night. 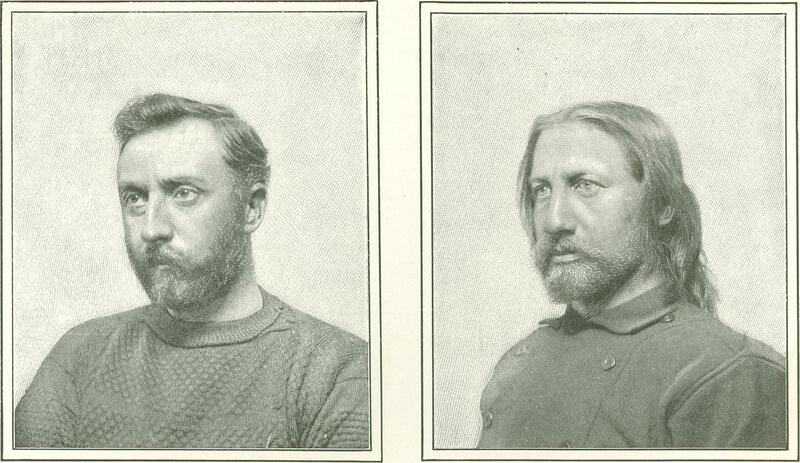 The men­tal symptoms were not so noticeable. The men were incapable of concen­tration, and unable to continue prolonged thought. One sailor was forced to the verge of insanity, but he re­covered with the returning sun. 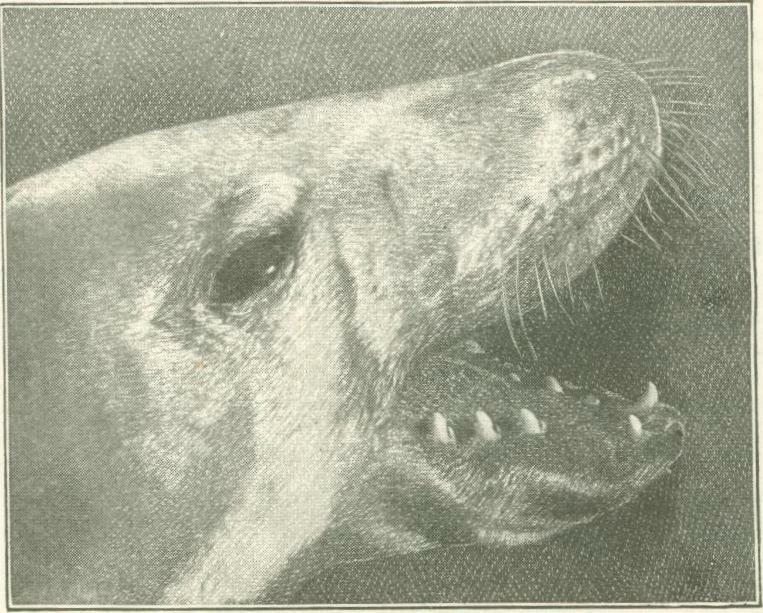 The first to feel the effects of polar anemia seriously was our lamented friend and companion, Lieutenant Danco. With the de­scent of the sun began the beginning of his end. On the short journeys which we took during the few moments of noonday twilight Danco complained of shortness of breath. Indeed, we all had some difficulty of respira­tion upon the slightest exercise, but Danco would frequently stand still and gasp for breath. For this he came under medical care early in May, but in spite of every effort he rapidly sank, and died on June 5th. His death and burial are scenes too sad for my pen. My ink is not black enough to paint them. The dayless nights passed slowly, while the general spirit of the men sank lower and lower, until midnight on June 21st. The sad death of Danco and the increasing debility of every one reduced hope and cheerfulness to the minimum. To combat this we now took to a forced diet of fresh meat. For­tunately, we had on hand quite a supply of penguins and seals, stored in the banks of snow. We sawed the frozen meat into steaks, and fried them in oleomargarine. The men improved so rapidly on this diet that, though they objected to its fishy taste, they volun­tarily ate it to the exclusion of almost every­thing else. Penguin and seal steaks, when once you have trained your nose to forget the odor and educated your palate to the dire needs of your system, are not bad. But to eat them is a matter of education under pressure. The flavor is unlike anything that 1 had tasted before. Imagine beef steeped in cod liver oil for several months and then fried in train oil, and you will have an idea of our most prized relishes. At noon on the 1st of July, there was a bright lemon-colored zone over the northern horizon, and from under it the wind came in gusts, with charges of snow so blinding that outside work or recreation was impossible. On the 4th of July, M. de Gerlache, with characteristic thoughtfulness, sent the stars and stripes to the masthead in honor of the day of American independence. For dinner that day we had an unusual menu, and we crowned our feast with appropriate toasts. Holidays and the like were the only excuse we had for an unusual time, and we took occasion to find as many of them as our fad­ing memories retained. Birthdays, national feasts, and holidays of various nations, and even church days were chosen as excuses to punctuate time by dinners and wine. Through the night there was nothing very remarkable connected with the celestial changes. Stars were visible at noon and at night in varying brilliancy and number, ac­cording to the amount of humidity in the at­mosphere. There are not in the southern hemisphere the numerous fascinating nebula seen in the northern skies; but the Magellanic clouds, the Southern Cross, and other groups give it a charm of its own. The moon paid us its regular visits, and was always hailed with joy. By moonlight we were able to do some traveling, and by it, occasionally, we were able to capture a pen­guin, which was always a happy addition to our larder. One of the seemingly impossible accomplishments of the practical jokers was the construction of an artificial star. There existed some rivalry between two depart­ments. For both it was necessary to have an observation of two fixed stars to deter­mine our position. Owing to the constant cloud of snow which hung on the horizon, it was difficult, and generally impossible, to see a star low down. An artificial star was accordingly made by fixing a lantern on a post, and the post was placed far enough from the ship to be invisible. The observer did not discover that his star was a hoax for several days. The Aurora Australis was in evidence on nearly every night of April, May, July, and August. It was never so bril­liantly luminous or so fantastic in figure as the Aurora Borealis. The usual form was that of an arc, without motion, resting low on the southwestern sky. Above and below it were ragged cloud-like fragments, which changed in form and brilliancy every few seconds. The color was faintly yellow, and the light emitted was never sufficient to be visibly thrown on to the surface snows. The sun in rising appeared above the hori­zon by refraction before actual sunrise. For three weeks the northern sky had been so light at noon that had we not known when to expect the sun we might have awaited its rise every day. On the 23d and 24th of July, a dull ball of fire rolled along the icy hummocks of the homeward sky, but the real sun did not rise to view until the 25th. Its face was pale, its light feeble, and its heat imperceptible. Weak and sickly as the old father of life seemed, he started within us renewed fountains of joy. The daylight at midday increased from a few minutes to hours, until finally, on the 16th of Novem­ber, all darkness disappeared, and the long sightless polar day began. The early part of this period was the coldest season of the year, the temperature ranging steadily from 30 to 40 degrees below zero. During the night of September 8th, the thermometer registered 45.5 degrees below zero. This proved to be our minimum temperature. Although men came in with frozen feet and hands and noses, they all agreed that the coldest weather was by far the most agree­able. The ice now separated, leaving large open leads of water. In these finback and bottle­nose whales gamboled about, but we saw nothing of the much-prized right, or black, whales. Seals and penguins, too, came out of the new fissure, and to get these for our larder was one of the sports of this time. The scene about the ship was now full of animation. Groups of men were sounding, others dredging the sea bottom, and still others placing the ship in order for the coming campaign. The regular ob­servations were prosecuted with unusual vigor. Everybody, act­ing under the new stimulation of the sun, worked with a surprising will and ambition. In November and December there was con­siderable change in the pack. The influence of the sun at noon was sufficient to re­duce the great amount of drift snow to a depth of less than two feet. The hum­mocks lost their soft, downy faces, and stood out in hand, irregular masses. New fissures ap­peared in vari­ous places, making the general dimension of the ice-fields smaller. The field in which we were imbedded, however, retained its original size. It was irregular in form, with a general diameter of two miles. This was somewhat greater than the average size of the fields about us. Between the fields, around the icebergs, and particularly around our field, there were lakes and lanes of water which would permit some naviga­tion. If we had been free, we might have forced a few miles daily to some new region. We had made preparations for a summer voyage of exploration to the outer part of the Palmer Archipelago, and then to the Weddell seas. As week after week of the short season passed we abandoned this ambi­tion and sought for some means to extri­cate ourselves. The end of November was the time fixed upon to leave the pack, but November and December passed without offering us the slightest hope of escape. The Christmas dinner and the New Year's Day wines raised our longings for freedom to a fever heat. The ship was firmly held at ­about 2,000 feet from the shore line. The ice between her and the edge was five feet thick in its feeblest places, and in some places it was twenty-five feet. How could we escape? Many had faith in tonight, an explosive of gun-cotton class, of which we had a great abundance. Tonight was said to be more powerful than dynamite, but our previous experiments with it had been total failures. In low temperatures it would simply make a cheerful bonfire without exploding. After these experiments the engineer threatened to use it as fuel to get up steam. When the temperature had risen to five degrees below zero, the explosive redeemed its reputation. It would explode; but it simply burrowed circular holes through the ice, which were of no service in releasing the ship. Seeing that dark surfaces absorbed a greater amount of heat than the even white­ness of the snow, I suggested cutting two grooves through the snow to the water line. My idea in doing this was to flood the grooves ­with water, or throw ashes and some other dark substance into them, and so increase the power of the sun to deepen them. 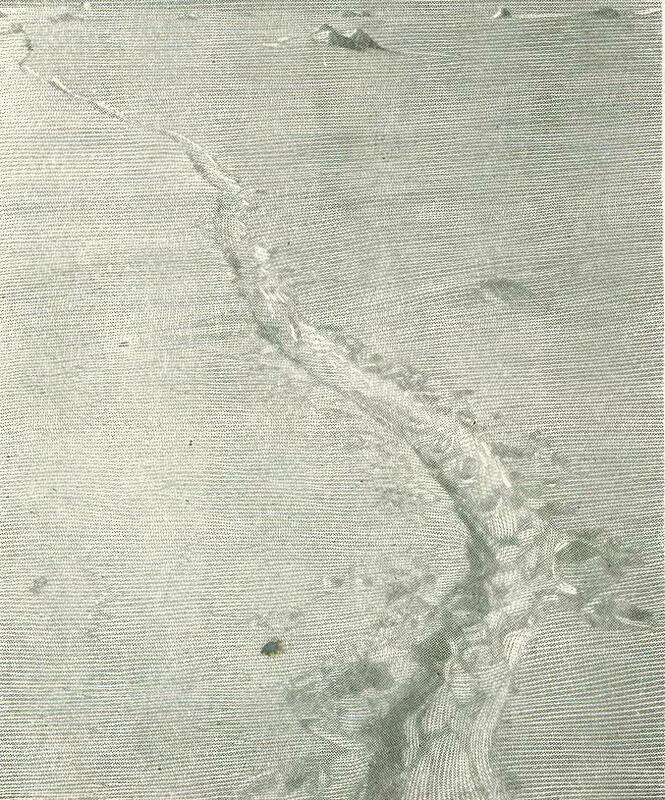 In ­this manner the ice would be weakened in a line with the ship, and it was hoped that it would eventually break in the way of least resistance. We did not begin this experi­ment until the early part of January, when the sun was already on the decline. 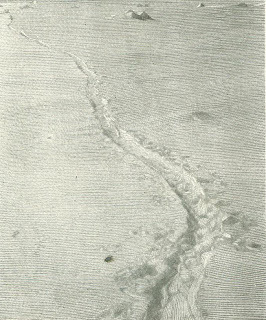 One of the grooves was finished, but the temperature was so low that the sun of midday was not sufficient to melt the fresh ice formed un­der the feeble sun of midnight. I next suggested the sawing of a canal large enough to permit a passage of the ship to the water's edge. This at first seemed utterly impossible. The distance was 2,400 feet. To do the work the entire force, in­cluding officers, numbered but sixteen men. We had no implements except six ordinary ice saws, which were too short. The canal was begun not with faith that it would ever be completed, but with an idea of keeping the men busy enough to prevent their worry­ing about our hopeless position. Once the project was commenced, everybody from the cook to the highest officer did his duty at the labor. We were strict equals at this time, all working as day laborers - some with saws, others with pick-axes and shovels. Divided into three groups, working eight hours each, we kept the saws and axes and shovels and explosives going throughout the day and night for five long weeks. On the 14th of February, we steamed out through the canal – free, and with our consciousness that we had won our release by our own hard efforts. Our freedom, however, did not last long. I two days we advanced forty miles northward, but then we came to a position in the pack edge where all efforts failed. We were held here for one month with the black sky indicating an open sea before us. We were preparing to fit up our second winter quarters for another years drift, when a gentle southerly wind forced us out beyond the line of icebergs, where the ice spread, and we quickly steamed into the open South Pacific. It was March 14th. The season for further exploration during this season was closed. Our provisions were almost consumed, and the general aim of our expedition was fulfilled. The nearest port was Punta Arenas, and we set a course for it. We left the pack from the longitude of 103 west and latitude 70 45’south. We had thus drifted from 80 to 103 degrees of longitude and between 70 and 72 of latitude. In March and April we drifted westerly to longitude 92 25”, where we were on April 25th. From May to October, we drifted back again to a place near our starting point. From November to the time we left the ice, we drifted rapidly westward. The winter drift then is eastward, the summer drift is westward, and this is also the direction of the prevailing winds. Our farthest south was on March 31st, 71 36” 5’, longitude 87 33” 30’. It would not at any time have been possible to push farther poleward in our position. The various soundings we took prove the existence of a sea where there was previously thought to be land. Through the soundings also we have discovered a submarine bank comparable to the bank of the coast of Newfoundland. The excellent series of observations by M. Lecointe indicate the magnetic pole to be about 200 miles east of its assigned position. The hourly meteorological observations, under the directions of M. Arctowski, are of priceless value to students of weather. The painstaking zoological work by M. Racovitza, and the numerous other observations and studies of Antarctic life and phenomena, are of a like value. As an American, I can with due modesty say that the work of this, the Belgian Antarctic Expedition, will form the stepping-stone to future Antarctic exploration.